Pier 21 on the Galveston harbor is kicking off Saint Patrick’s Day weekend with drink specials, live music, and plenty of fun! The first ever Party on the Pier will start the season with merry making and much celebration as The Classix perform oldies hits for visitors and locals. Featuring live music monthly from 6 p.m. to 9 p.m. on the third Saturday from March through October, Party on the Pier is Galveston’s newest family friendly event and live music scene. As a special treat during Spring Break and in honor of Saint Patrick’s Day, Olympia Grill and Nonno Tony’s are offering unique beverage specials for visitors to Pier 21 during Party on the Pier. All weekend long, Olympia the Grill at Pier 21 will offer patrons green beer in celebration of the most popular Irish holiday. Not to be outdone, Nonno Tony’s will offer a special Happy Hour during featuring $3 Guinness imported directly from Ireland. All three restaurants on the pier offer an outdoor dining experience where patrons can enjoy the musical offerings of The Classix. The Houston based band has performed oldies and classic rock hits at numerous venues in the Houston and Galveston areas including popular concert hall, The House of Blues. 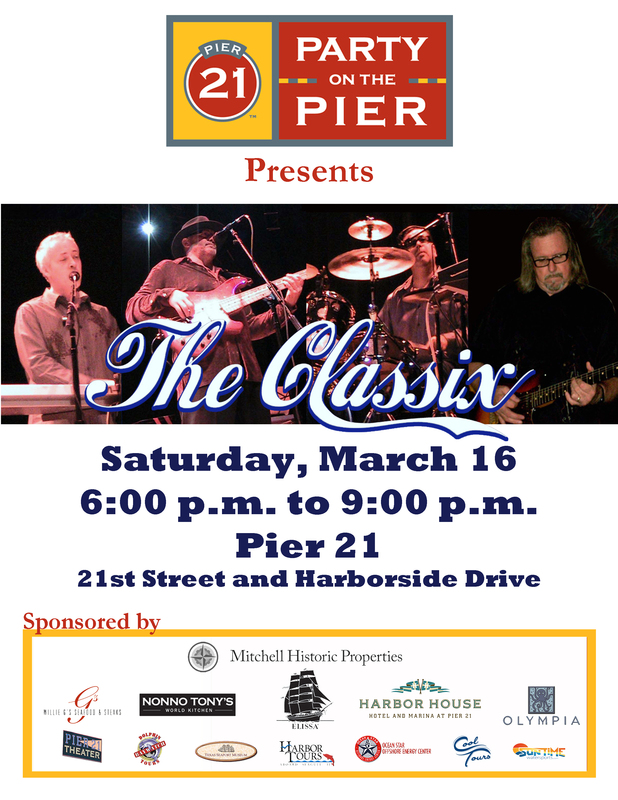 The band offers a mixture of radio favorites ranging from ‘60s music through the present for visitors to the pier. 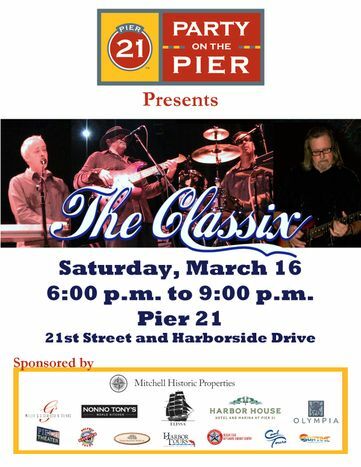 The Classix are kicking off the newest season of live music entertainment for downtown Galveston. Their appearance at Party on the Pier will open a regular series of live music events. Party on the Pier takes place on the 3rd Saturday of the month from March through October from 6 p.m. to 9 p.m. at Pier 21. The year’s lineup includes performances by popular Austin bands such as The Whiskey Sisters, Carolyn Wonderland, Del Castillo and Vallejo. For more information about Pier 21 and Party on the Pier, visit www.Pier21Galveston.com. Party on the Pier is sponsored by Mitchell Historic Properties and the restaurants and attractions at Pier 21 including Willie G’s Seafood and Steaks, Nonno Tony’s World Kitchen, Olympia the Grill at Pier 21, Texas Seaport Museum, Tall Ship Elissa, Ocean Star Off Shore Energy Center, Pier 21 Theater, Sun Time Watersports, Baywatch Dolphin Tours, Harbor Tours aboard Seagull II, Cool Tours, and Kona Ice.